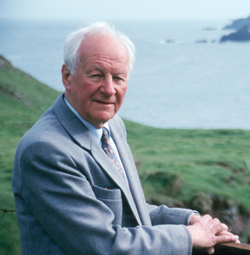 The most beloved of evangelical pastors and theologians in the last 30 years is probably John Stott, who although an Anglican from Great Britain has nonetheless been calming influence, a source of clarity and conviction, and a convening force for evangelicals in America and the world over. Stott has written more than 50 books, including Basic Christianity, The Cross of Christ (of which J. I. Packer says: “No other treatment of this supreme subject says so much so truly and so well.”), and Evangelical Truth. He has traveled regularly to the United States, and his prominence within North American evangelicalism was reflected in his role as Bible expositor on six occasions at Urbana, the triennial student missions convention arranged by InterVarsity Christian Fellowship. “This is why so many people are so misinformed about evangelical Christians. There is a world of difference between real-life people of faith and the made-for-TV, Elmer Gantry-style blowhards who are selected to represent them. Falwell and Pat Robertson are held up as spokesmen for evangelicals, which is ridiculous. Meanwhile people like John Stott, who are actually important, get ignored. It could be that you have never heard of John Stott. I don’t blame you. As far as I can tell, Stott has never appeared on an important American news program. A computer search suggests that Stott’s name hasn’t appeared in this newspaper since April 10, 1956, and it’s never appeared in many other important publications. “John Stott has provided a model for international city-centre contemporary ministry now so widely accepted that few now realize its original innovative nature.” Central in this model were five criteria: the priority of prayer, expository preaching, regular evangelism, careful follow-up of enquirers and converts, and the systematic training of helpers and leaders. One of Stott’s major contributions to world evangelization was through the 1974 International Congress on World Evangelization held at Lausanne, Switzerland. John Stott acted as chair of the drafting committee for the Lausanne Covenant, a significant milestone in the evangelical movement. As chair of the Lausanne Theology and Education Group from 1974 to 1981, he strengthened evangelical understanding of the relation between evangelism and social action. He was again chair of the drafting committee for the Manila Manifesto, a document produced by the second International Congress in 1989. Although known for a gentle tone and for his embrace of dialogue among varied groups of Christians and with other faiths, Stott makes it clear that he does not believe truth is plural. Stott has publicly considered the idea of annihilationism, which is the belief that hell is incineration into non-existence rather than eternal conscious torment (the traditional evangelical view). This has led to some criticism and some support. Despite his formal retirement from public engagements, he is still engaged in regular writing. In January 2010, at the age of 88, he launched of what would explicitly be his final book: The Radical Disciple.